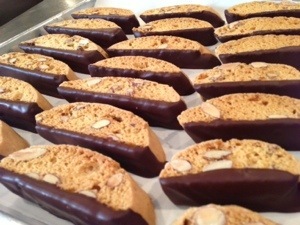 Here are my Biscotti di Prato, a recipe that I learned while in Firenze. These twice-baked cookies are not too sweet and full of whole toasted almonds. I veered from tradition and dipped the bottom in lovely dark chocolate. I actually call them Biscotti di Prato on the packaging. Thanks for the suggestion. I am totally with you on the take down of Olive Garden!